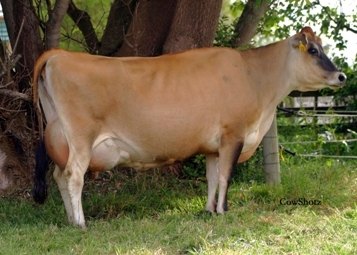 GLENBROOK SAMS CAIRO 706 KGS MS GLENBROOK LEMVIG CRUMPET 706 KGS MS.
9 in now. July herd test. Another poor test. First two cows in. 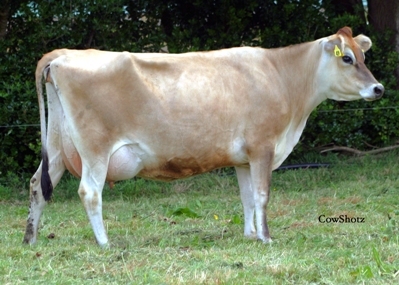 Sadly lost GLENBROOK COMMANDO CASE who calved first. Her calf by Samual born 3/7/08. Today GLENBROOK MAXIMUS CLOVER calved. She looks good. Photo of three retained Autumn 08 heifer calves, by Conductor and Czar. Been a while since I did this so a bit of catching up to do. GLENBROOK 2007-08 top records completed. 41 head grossed $54,412 and averaged $1327. 66 head in sale, 3 withdrawn before sale, 14 passed. In case you are wondering why so many passed, the agents knocked most of those down to a buyer number 50 at around $1000. It wasn't till an hour after the sale that they told us there was no number 50 and these were unsold. Needless to say this wasn't my idea, I had expected it was an unreserved sale except for a couple of lots that I said before they were put up. Very unhappy with that but can't do anything about it. Another very poor herd test, this time caused by a change in feed. the cows are still adjusting to feed changes and are currently producing at lowest levels for 8 years. There is only one way to go from here on in and now I have a feed supplier that I can control the ration and change it as I want to . This is a new development as before I have only been able to use what the companies sold. So its all a learning curve for me. But one that will bring great results in the future. Just very hard on cows now. Had some more rain but not enough yet. Very poor herd test mainly due to the pellet company overdosing the cows with mag oxide. They went from 1.7 a cow to the lowest herd test in the last 7 years. All seem to have recovered now but it wasn't nice for the cows. 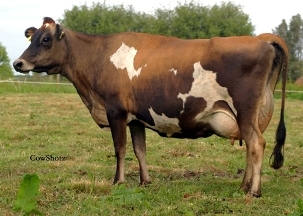 Sale catalogue is now online at Welcome to PGG Wrightson - Dairy Auctions . 47mm rain this morning so hopefully the drought has broken but we need a follow up to this rain. Had 69mm this month same as last year and behind the 77mm recorded in 2006. This article needs to read and read again for anyone interested in breeding of any sort. Copy and paste it and print off to reread. Its worth it. Catalogue is all finished and should be out on time. Nearly finished calving with 1 to go. 3 sets of twins out of 33 in is amazing. Still no rain and therefore no grass. First 4 GLENBROOK COMMAND CHIEF daughters are in and look good considering the total lack of feed. Working on catalogue for sale on 29th April. If anyone from anywhere in the world wants a catalogue could you please send me an email at mailto:glenbrook@farmside.co.nz . It should be online about the 20th and I will post a link here once it is. 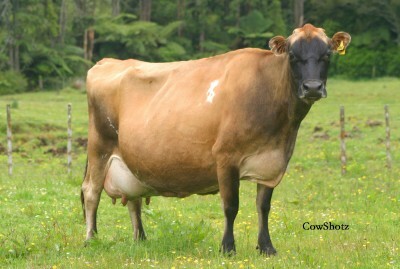 Caper won the two year old class at the Hawera Jersey Club Show this month. She also got Reserve Champion. Also old Cotton got 4th in the 10+ year old class as a rising 16 year old. 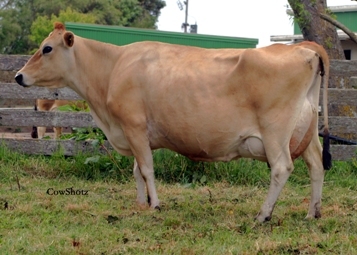 GLENBROOK SAMS COOLEST VG2 [7-9] continues to milk well as a two year old with 1.70 kgs ms this month. She now is BW 247. PW 337. LW 504. Half Autumn calvers in already, was due to start 25th Feb. Half heifers in as well. Feb finished with 12mm rain but we did get 8mm today [ all of which came during milking last night ]. Started feeding some maize silage for the first time in my farming career last week. The cows are not so keen on it yet. Still waiting for Procow which was ordered 4th Feb but promised by next Wednesday. Had cows judged for SEMEX contest last week. Only 3 or 4 entries from Taranaki which is hopefully only down to the weather. Still at least Glenbrook should finish in the top 4 for Taranaki. Had 11mm rain so far this month which hasn't made the slightest difference yet. Last years Feb herd test was 2.02. This year 1.77 kg ms.
Third month in a row for COTTON to give the most milk. Cottonseed is out of Cotton. Cairo is out of Cottonseed. Had 4 calves so far which is not so good with no grass and not due to start till the 25th Feb.
Bull proofs for GLENBROOK bulls as at 19th Jan 2008. Click on an AB Code or Name for more information. Cows coming in for milking last night. Lowest Jan herd test for several years. So far this month we had one day with rain, at least that was 35mm. From this herd test COOLEST produced the second highest ever fat from a two year old on test day and also maybe the first time a two year old has finished second in the herd. COTTON again was top cow for milk. For anyone keeping up with the Herd Home saga hopefully I am getting the new grates tomorrow. This is the herd home with grates taken out and stacked in the paddock waiting for the truck. New year so far is dry after finishing with only 876mm rain in 2007 following 1328mm in 2006. Just adding a few photos throughout the web site. These are two bulls that had limited use here. First of all I would like to wish you all a great holiday season. Latest herd test results are below. Typical of this year its a little disappointing as the cows were doing 2.10 kg ms a week ago. The autumn calvers are only going to finish around the 540 kgs ms mark but they have had it tough all year. The pellets have been the biggest trial as each load has been different from the last one and they have run out several times the worst being when we had the tornado and there was no pellets for 6 days. At that time they also had no water for 2 days and got down to 11 litres a cow for a while so I think they did well to come back at all from that. Next year will be better. for milk with 23.6 litres. Photo taken today. Just working out lots of pedigrees and thought I would put Brenda's up here. Buttercup was the calf carried when I brought Brenda. All the rest of this family have names starting with "C" at GLENBROOK. NEAT IRENE was bred by Mullane Bros, Bolinda, Melbourne, Australia. GLENBROOK sale 29th April 2008. Over a third of the herd will need to be sold at this stage due to loss of current land so there will be plenty of high producing, good looking cows and heifers on offer. Mark your calendar now. Production records for NZ for 2006-07 season saw GLENBROOK at number two for fat, protein and milk solids. 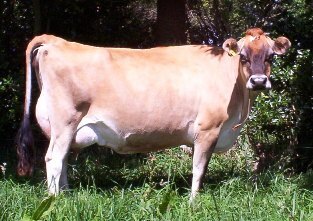 GLENBROOK CHAMPION CREAM was the highest earning cow in TARANAKI. Glenbrook won the PIONEER trophy for top herd in NZ under 100 cows and also the top per ha. production in Taranaki. Had to put down Glenbrook Mikkel Couplet with a dislocated hip the other day. As she was 15 years old it was fairly sad. Couplet has been a favourite here at Glenbrook for many years. Another reasonable herd test this month with the 2 year olds doing real well. Good herd test but the factory is better. Cows did 2.20 kgs ms yesterday at the factory. Getting close to my all time record. The horrible weather isn't helping. Think what they could do with some sunshine and no wind for a few days. Coolest is breaking all 2 year old records this season with over 26 litres this month. 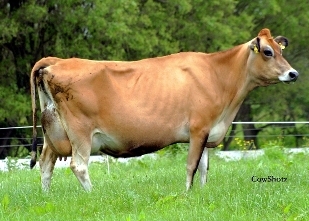 See GLENBROOK HERD TEST RECORDS for new updates after this test. At the Whitimore dispersal sale this year Glenbrook added the first cow for many years to the herd. She was 220 days into her lactation at time of purchase and now has completed that record. She is a tremendous cow and a delight to own. Probably the first time ever the September herd test was lower than the August one but its been hard here. Grass still not really growing and its been very cold. Of interest is that Coolest is now the 6th heaviest milking 2 year old ever at Glenbrook. Calving all over with last one in this morning. Sold most of the calves this season to make it easier for me. Have reared 4 heifer calves and 2 bulls. This months herd test is a little better.